The considerably bright, very large edge-on spiral NGC 4565 is another showpiece for amteurs, and often used in textbooks, as it is assumed that its view may resemble that of our own Milky Way, seen from outside from a place situated near its galactic equatorial plane. According to R. Brent Tully, NGC 4565 is about 31 million light years distant. Our image was taken by Jack Newton in East Sooke, British Columbia. He uses a Santa Barbara Instrument Group ST 6 CCD camera at the Newtonian focus of his 25 inch f5 telescope. 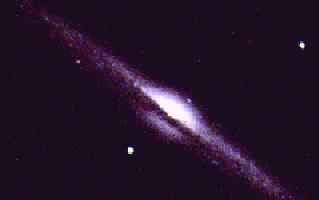 The image is a tri-colour composite, approximately 5 minute exposures. 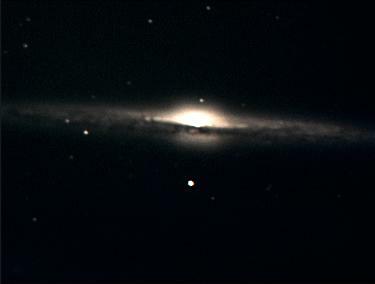 We also have an image of NGC 4565 by Michael Purcell (taken April 16, 1996 at 22:23, with a Meade 10" f/6.3 SC and ST-7, exposed 13.4 minutes), and a photo by John Sefick taken with a 25-inch Newtonian and ST6 CCD camera. In the SAC 110 best NGC object list. Caldwell 38 in Patrick Moore's list. In the RASC's Finest N.G.C. Objects Objects list. David McDavid of the Limber Observatory, Texas has made available online a polarization map of NGC 4565. 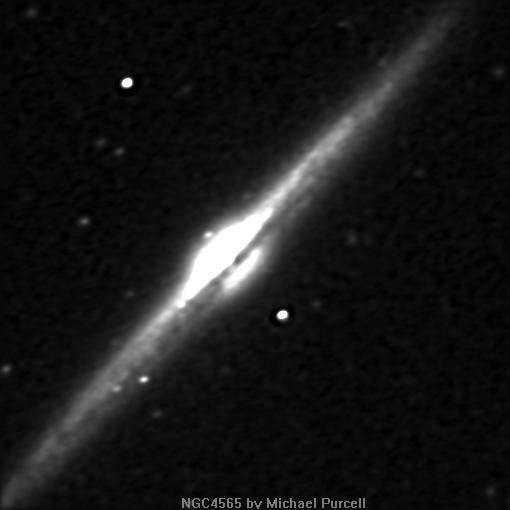 Also look at the DSS image of NGC 4565 provided by Bill Arnett.